The Great Dane: a big - very big - playful pup whose enthusiasm for everything is a delight. A big dog like this one needs the right dog toys to keep them happy and engaged at playtime but which are the best choices? Here's a look at some of the best reviewed and most popular dog toys for Great Danes available right now. Always supervise your Great Dane when he gets a new toy. Every Great Dane loves treats - remember Scooby Doo? - but adding them to a treat dispensing toy like the Starmark Treat Dispensing Chew Ball Dog Toy makes getting them both a fun game and an exercise in mental stimulation, something a smart pup like a Great Dane will really benefit from. The Starmark ball is crafted from a tough yet still flexible rubber that is designed to feel pleasant in a dog's mouth. Its ridged outer makes it easier for your pup to hold onto during a game of catch and fetch and it rolls and bounces easily and even floats on water, making it a great choice for pool play times as well. As its name suggests the ball also doubles as a great solo play time chew toy, and according to many positive online reviews it stands up to aggressive, heavy chewers - which many Great Danes are, very well. Some pet parents report their pup has had the same ball for years, even if they normally make very short work of other chew toys. When it comes to the addition of treats, the ball can be used with the kibble of your choice - the opening is about the size of a quarter, so lots of different types and sizes can be used - and as your pup rolls, throws and chews the ball treats will be dispensed at a measure pace. When it comes to the addition of treats, the ball can be used with the kibble of your choice - the opening is about the size of a quarter, so lots of different types and sizes can be used - and as your pup rolls, throws and chews the ball treats will be dispensed at a measure pace. Those who have purchased this toy in the past not only praise its durability but also its ease of use and its level of 'difficulty' as a puzzle toy, with many reporting that it keeps their Great Dane fur kids occupied for hours. 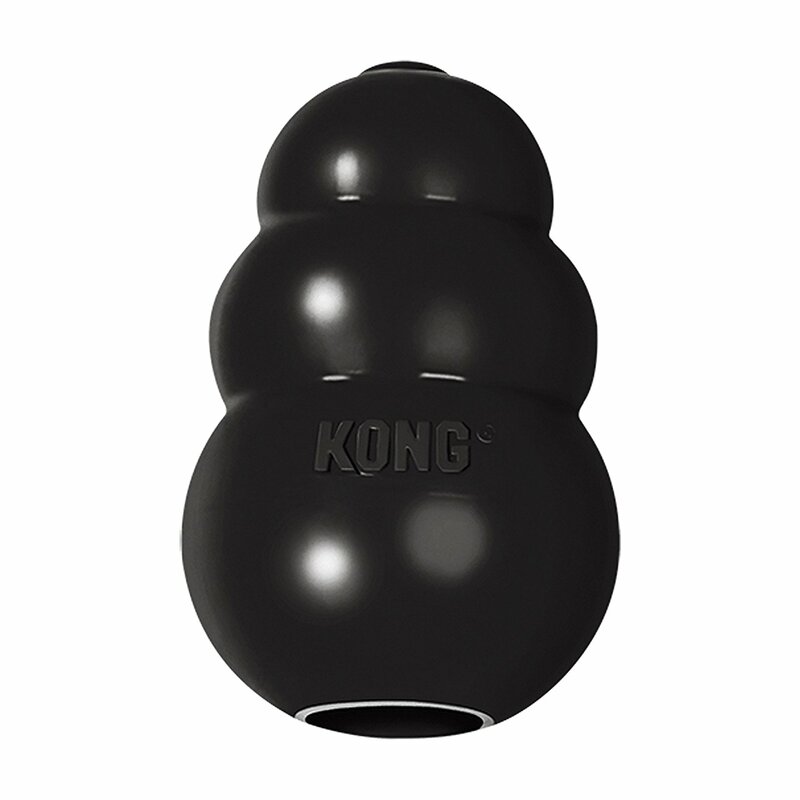 KONG is a well-known name in the dog toy industry. 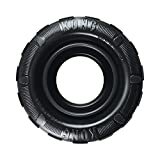 The company has gained itself a great reputation for offering durable, engaging toys for dogs of all sizes - and breeds - and this tire toy brings all the fun of playing with a real tire - the bouncing, rolling, chewing fun - to your pup in a smaller, safer form. Crafted from a durable, but pliable, hard natural rubber the toy resembles a real tire so does have 'treads' that make it easier for a pup to grip. Also like a real tire the toy features an 'inner tube' which can be filled with treats of your choice to add an extra element of engagement to play. Those who love this toy report that it is very durable, standing up to aggressive chewing very well, and that in many cases it has because their fur kid's favorite go to toy for both outdoor fetch and catch games and for solo play and lots of the online reviews from pet parents recommend it as a great choice for a large breed dog like the Great Dane. 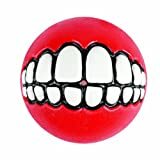 What makes this dog toy stand out initially is its bright, colorful and amusing appearance, thanks to the 3d cartoon teeth that are featured prominently on one side of the ball, that, when positioned just right in a pup's mouth looks just like a set of false teeth, something that many online reviewers find both amusing and endearing. Looks aside, past purchasers praise this toy for its versatility, as it is both a great fetch toy and a puzzling treat dispenser. It is made using a soft but durable - and chew resistant - material that is lightweight and water resistant, meaning that this is a toy that can be taken to the pool or the beach so your Great Dane can enjoy some watery fun. A number of different kinds of treats can be added to the ball, and as it is very 'chew resistant' it can be used to help prevent destructive behaviors when your pup is left alone. For a Great Dane that likes to play doggie soccer - or enjoys water play - this large ball - it's 14" in circumference - presents an opportunity to have a lot of energetic fun, something every big dog needs. 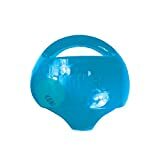 This hard, plastic ball is, reviewers report, almost impossible for even aggressive chewers to damage and while it is not a bouncy ball it does roll - and float - effortlessly allowing, as the name suggests, big dogs to push, prod and roll it along to their heart's content. Past purchasers report that the ball is indeed very tough - some pups have owned the same ball for years and it is still going strong - and that their larger breed dogs really enjoy playing with it, even when they are playing alone. Another toy from the best-selling KONG line – and the KONG Jumbler Ball Dog Toy is no exception. At first glance the KONG Jumbler Ball Dog Toy looks rather unusual. It is essentially two balls in one. The large, outer ball is clear and crafted from a durable, chewable plastic and has a handle at the top that makes it easier for both humans and pups to grasp and toss. The inner ball, a tennis ball, adds an extra element of engagement and it even squeaks when the outer ball is moved in a certain way, making solo playtime with the ball even more fun. Previous purchasers praise this ball for its great durability, and for the addition of the handle that makes it easier for larger dogs like a Great Dane to keep hold of and carry. Many also reported that the squeak element is very engaging, although it did take some pups a while to figure out just where to bite it to elicit the sound. The KONG Extreme Wobbler is one of the company's best-selling toys and for good reason pet parents report, as it is versatile, durable and fun. I have had multiple dogs and the Wobbler has been a constant toy in my arsenal! The name comes from the fact that this egg shaped toy wobbles, but won't topple over, a lot like the Weeble toys you might remember from your childhood. It can be used in games of fetch though, and its unpredictable bounce can make those sessions more engaging as well. The Extreme label is there to indicate that this toy is designed for 'power chewers' and the majority of reviewers report that it does live up to the promise that the toy is very durable. Many pet parents who have purchased this toy like it because it makes a great solo play toy. The Wobbler can be filled with almost anything edible, but the most popular choice is to fill it with peanut butter or doggie ice cream. To extend playtime it can be safely frozen for a few hours before handing it over to your pup to play with and enjoy manipulating and chewing it until they have got to every last drop of their special treat, keeping them occupied and mentally stimulated for hours at a time. Even a big dog like the Great Dane likes to have a soft, cuddly friend to play, and then nap with. The problem that many pet parents of Great Danes often encounter however is that their big, boisterous pups are often so keen to play with a new stuffed friend they destroy it within just a few hours, and it becomes little more than a pile of stuffing and ripped fabric far too quickly. Many of the positive online reviews of the Frisco Skinny Plush Squeaking Raccoon Dog Toy mention how impressed pet parents are with the durability of the toy, with many expecting that their 'power chewers' would rip up the racoon in hours only to find it remains intact for months. Some report that their pups did 'kill' the squeakers rather quickly but because the quality of construction is good the toy was still popular with their pups who did not seem to mind that their 'friend' had gone silent. Apply the same caution you would to playtime and toys you would choose as you would to your Great Danes nutrition. Whatever dog toy you choose for your Great Dane- the ones listed here are just a very small sample of those available both at your local pet store and at pet outlets online - there are certain things that you should look for in any toy. The first is durability. Most Great Danes are power chewers and while no dog toy is indestructible looking for one that is tough enough to provide a reasonable amount of playtime - the longer the better - before it needs to be retired. 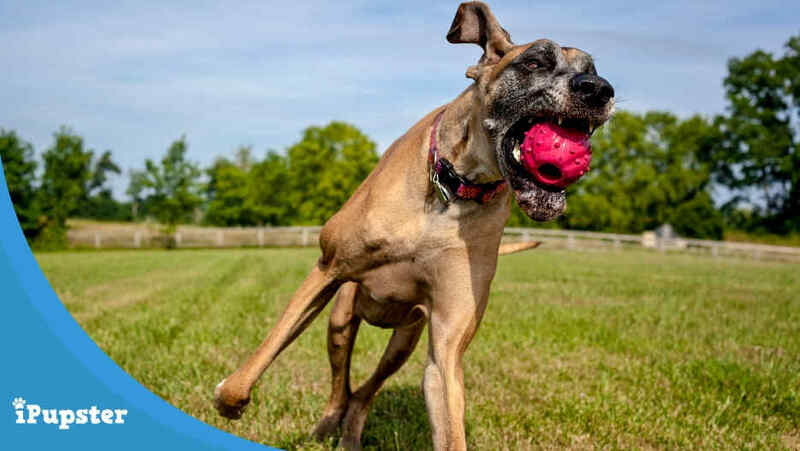 As Great Danes are energetic and intelligent pups they also benefit from toys that offer both a mental and physical challenge, as is the case for a number of the toys on our list. Most of the toys listed here offer an element of 'chew time' for your pup, but even these well reviewed and popular chew toys should be used with some basic safety tips in mind. Whenever a new chew toy is introduced the play should be supervised, to ensure that the toy remains intact, and if it does not that it is removed and inspected before it is played with again. A handful of dog toys can still be safe for use when an element is missing - a broken but still concealed squeaker for example - but many will have to be removed and replaced. This initial supervised play can also be very useful for gauging how engaging and enjoyable your pup finds the toy. As many pet parents look for toys that can help keep their fur kid happy and engaged when alone this time is great way to discover if the latest addition to your pups' toy box fits the bill. Finally, there are many good deals on Amazon for quality cheap dog toys by looking through their discounted best-selling dog toys. Here are some 50%-70% discount dog toys at Amazon and if you're on Amazon Prime you can have further savings on shipping and handling costs. What’s your Great Dane' favorite toy and why? A Dog Blog dedicated to providing news, tips and advice for dog owners worldwide. All Content © 2018 iPupster.com . All Rights Reserved.